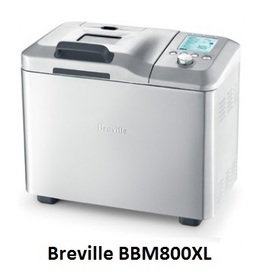 Compare Top Bread Makers: Cuisinart, Zojirushi or Breville? Most of us buy ready made bread. We're either too busy to make it ourselves or we think it's too complicated to make it successfully at home. In any case, why bother when there are countless bakeries out there where we can always find our favorite loaf? With this kind of reasoning, we miss some important advantages of making our own bread. For starters, we can't be hundred per cent sure about what goes exactly into our commercially bought bread. If we want to control what goes into it, then we need to make it ourselves. Second, when we make our bread we can create all kinds of new tastes and colors by adding healthy ingredients such as nuts and fruits of our choice. Last but not least, nowadays, it’s wrong to think that it is difficult and complicated to succeed making your own bread. The best bread making machines available today almost completely automate the process by controlling the various cycles and guiding the user so no errors can be made. Each of the three bread machines that we'll be comparing here is equipped with built-in bread recipes that can be invoked from its control panel. Once a bread recipe is chosen, the machine will take over and go through the steps and cycles required by the recipe. It will knead and mix as needed, apply the right temperatures as well as the required various cycle times, and will prompt you for the ingredients to be added at the right time so no errors can be made. Note also that these machines also include built-in recipes for the preparation of various types of dough for making pastries, pizzas, pasta, etc. This article will compare Cuisinart CBK-200 Convection, Zojirushi BB-PAC20 Virtuoso and Breville BBM800XL Custom Loaf bread making machines. These were not just the most popular among Amazon customers at the time this article was written, but they had also received excellent reviews from most Amazon buyers (an average of at least 4 stars each, out of 5 stars!). They are simply the best available bread makers. Selected Bread Makers on Amazon. Cuisinart: It comes with one paddle that is used for kneading and mixing. It can be removed for cleaning. Zojirushi: Two paddles are installed and operate at the same time for thorough kneading and mixing. They can be removed for cleaning. Breville: It has one collapsible kneading paddle for dough that thoroughly mixes ingredients then collapses before the bake phase to minimize the hole at the base of the baked loaf. It also comes with a fixed paddle for jam making. The two paddles are not used at the same time and are removable for cleaning. 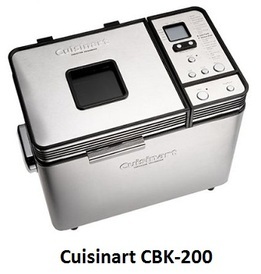 Cuisinart: A fan circulates air throughout baking cycles for better overall browning and crispier crust. Zojirushi and Breville have no convection feature. Cuisinart loaf sizes: 1.0 lb, 1.5 lb, 2.0 lbs. Zojiroshi loaf size: 2.0 lbs. Breville loaf sizes: 1.0 lb, 1.5 lbs, 2 lbs and 2.5 lbs. Note that the Cuisinart and Breville bread makers come with a single baking pan. The different size loaves that they produce are a function of the quantities called for by their builtin recipes. The automatic kneading action as well baking temperatures and times will adapt to smaller loaf sizes consistently within the included bread pan . With Zojirushi, even though the builtin recipes are tailored to bake 2.0 pounds loaves, you can bake smaller loaves using the Home Made course which allows you to modify various settings, but you'll need to experiment both with quantities and associated baking times before you can be assured of successful results. With all three bread makers considered here, once a bread recipe is chosen from their control panel, the machine goes through the steps and cycles required by the recipe and prompts you for the ingredients to be added at the right time and for anything else that you need to do to successfully complete the recipe. Delay Start Timer Button: Press to program baking for a later time. Just set the Delay Start Timer for a finish-time up to 12 hours later. Mix-ins Button: An audible signal will alert user when to add extra ingredients. Press this button once to deactivate the Mix-ins feature. The Mix-ins feature automatically defaults to on. Note that there are no Mix-ins signals for Low Carb, Quick Bread, Gluten Free or Last Minute Loaf program options. Menu Button: Press to scroll through the 16 menu cycles or courses offered and to to select one (the numbers on the LCD screen will correspond with the numbers on the control panel). The cycles offered are White/Rapid White/Whole Wheat/Rapid Whole Wheat/French or Italian/Rapid French or Italian/Quick Bread or Cake/ Low Carb/Gluten Free/Dough or Pizza Dough/Artisan Dough/Sweet Breads/Rapid Sweet Breads/Jams/Last Minute Loaf/Bake Only. Crust Button: Press to select desired crust color (Light, Medium or Dark). The machine automatically defaults to Medium. Loaf Button: Press to select desired loaf size: (1 LB, 1.5 LB or 2 LB). The machine will automatically default to 2 LB. Start Button: Press to start the program selected, and to resume after Pause. Stop/Pause Button: Press once to pause the cycle for 15 minutes after which the unit will resume the set menu program. To reactivate before 15 minutes, simply press Start again. Press this button once and hold for three seconds to stop machine. Select Course Button: Press to select the dough preparation and baking course. Nine selections are offered: Regular Basic/Quick Basic/Regular Wheat/Quick Wheat/Gluten Free/Regular Dough/Quick Dough/Jam/Cake/Sourdough Starter. If we also consider the explicit Home Made selection on the panel, the number of selections becomes 10. Crust Control Button: Press to select the crust color (Regular, Medium or Dark). This function is available only for Regular, Basic, Quick Basic, Gluten Free and Cake courses. Home Made Button: Press to select one of the 3 home made recipe memories. Cycle Button: Press to select the cycles to be modified when using the Home Made selection. Timer Button: Press to select when you’d like the loaf to be ready and the bread maker will automatically start at the appropriate time. Timer Setting Buttons: Press to set the current time, the time for each cycle of the Home Made course and the Timer. Cancel Button: Press and hold to cancel the current process, or press to cancel the setting. Start Button: Press to start the process or set the Timer. The light flashes when the time is preset. WEIGHT & TEMP Button: Press to convert the default imperial temperature and weight (°F and lbs) to metric units (°C and kg). BEEPER Button: Press to mute the sound alerts. The LCD screen will display the symbol when the sound alerts have been muted and no symbol when the sound alerts are on. LIGHT Button: Press and hold to illuminate the interior baking chamber. DELAY START Button: Press to select when you’d like the loaf to be ready and the bread maker will automatically start at the appropriate time. MODIFY Button: Press to modify the default temperatures and times for the ‘preheat’, ‘knead’, ‘rise’, ‘punch-down’, ‘bake’ and ‘keep warm’ phases. CANCEL Button: Before the cycle is activated, press to return to the main menu. After the cycle is activated, press and hold to cancel the cycle. START & PAUSE Button: Press to activate the cycle. Press and hold to pause the cycle; the LCD screen will display a flashing ‘PAUSE’ until the button is pressed again to resume the cycle. SELECT Dial: Scroll the dial to select from 14 settings, 3 crust colors and 4 loaf sizes. The 14 settings are: Custom/Basic/Rapid Basic/Whole Wheat/ Rapid Whole Wheat/Gluten Free/Crusty Loaf/Sweet Breads/Yeast Free/Bread Dough/Piazza Dough/Pasta Dough/Bake Only/Jam. The Custom setting is used in conjunction with the MODIFY button to change the default temperatures and times for the ‘preheat’, ‘knead’, ‘rise’, ‘punch-down’, ‘bake’ and ‘keep warm’ phases. Up to 9 custom recipes can be generated and stored. Cuisinart has 16 preprogrammed selections: White/Rapid White/Whole Wheat/Rapid Whole Wheat/French or Italian/Rapid French or Italian/Quick Bread or Cake/Low Carb/Gluten Free/Dough or Pizza Dough/Artisan Dough/Sweet Breads/Rapid Sweet Breads/Jams/Last Minute Loaf/Bake Only. There is no setting for custom recipes. Zojirushi has 10 preprogrammed selections: Regular Basic/Quick Basic/Regular Wheat/Quick Wheat/Gluten Free/Regular Dough/Quick Dough/Jam/Cake/Sourdough Starter. Note that there is also a Home Made menu setting that allows to preprogram three more custom made recipes. Breville has 14 preprogrammed selections: Custom/Basic/Rapid Basic/Whole Wheat/ Rapid Whole Wheat/Gluten Free/Crusty Loaf/Sweet Breads/Yeast Free/Bread Dough/Piazza Dough/Pasta Dough/Bake Only/Jam. The Custom selection allows to create your own recipe. It is used in conjuction with the Modify button to modify default cycle times and temperatures as required by the custom recipe. All three bread makers have a gluten free recipe setting or selection. Zojirushi has the Home Made setting which is used to store up to 3 custom recipes. Breville has the Custom selection on the dial which is used to store up to 9 custom recipes. Cuisinart does not have this feature. The three crust shades are: light, medium, or dark. All three machines have a timer that allows you to add all the ingredients at night and it will start baking in the morning or whenever you set it for. The maximum delay time for Cuisinart is 12 hours, for Zojirushi 13 hours and for Breville 13 hours. Breville has a special dispenser where fruits, nuts, seeds, chocolate chips, etc. are placed. The machine automatically adds them to the recipe when required. Cuisinart and Zojirushi use audible tones to prompt the user for adding fruits and nuts when required by the recipe. The removable bread pan of all three bread makers allows easy cleaning. These pans have a special high quality and extremely durable non-stick coating. It is the best type of coating you can get for safe non-stick baking. All three machines are equipped with a window that allows you to look in throughout the process to check the progress of the loaf. 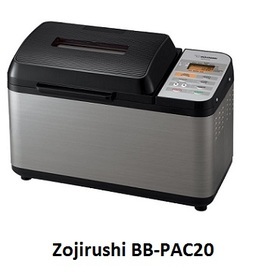 The Zojirushi bread maker is made of brushed stainless steel base with black acrylic top. All three machines come with a user manual and recipes, but the Zojirushi also provides an instructional DVD. So which of the three bread machines to choose? Only Cuisinart has the convection feature during the baking cycle. However, the Zojirushi bread maker has two heating elements, one of which is on the lid. This achieves excellent overall browning and crispier crust. Only Zojirushi and Breville have a selection for preparing your own bread recipes. Zojirushi can store up to 3 custom recipes while Breville can store up to 9. Cuisinart does not have this feature. Only Breville has a fruits and nuts dispenser and the machine adds fruits and nuts automatically as required. Cuisinart and Zojirushi bread makers prompt the user for adding fruits and nuts. Only Breville comes with a paddle that collapses before the bake phase to minimize the hole at the base of the baked loaf. 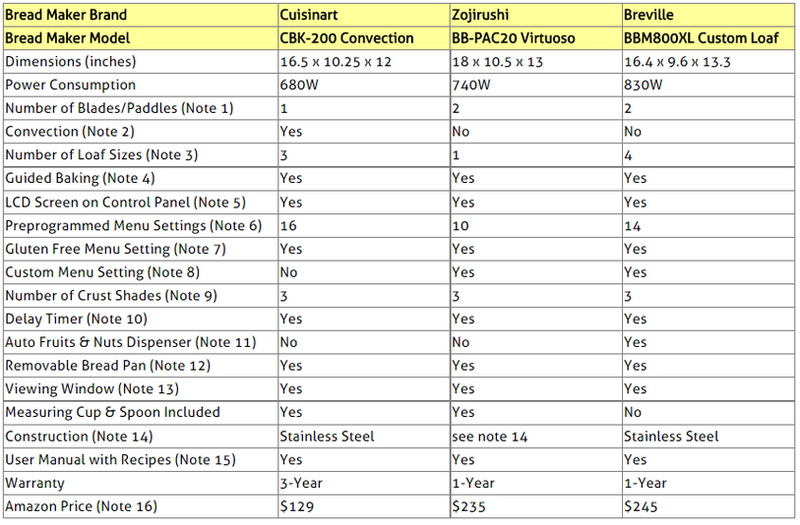 Cuisinart has the best warranty (3 years as opposed to 1 year for Breville and Zojirushi) and is the lowest priced of the three. Finally, at the time this article was written, Zojirushi had the best Amazon rating of the three machines, 5 stars out of 5! Breville had 4.5 stars and Cuisinart had 4 stars. Please click the bread machine of your choice below for price information or to purchase.